Directions: The map link will take you directly to the lighthouse, which has a large parking lot, but this is not where the photo was taken. About 200 feet east (towards the ocean) is an additional beach-access parking lot. If you walk out to the beach and look west you will see the lighthouse through the reeds, and this is where the photo was taken. 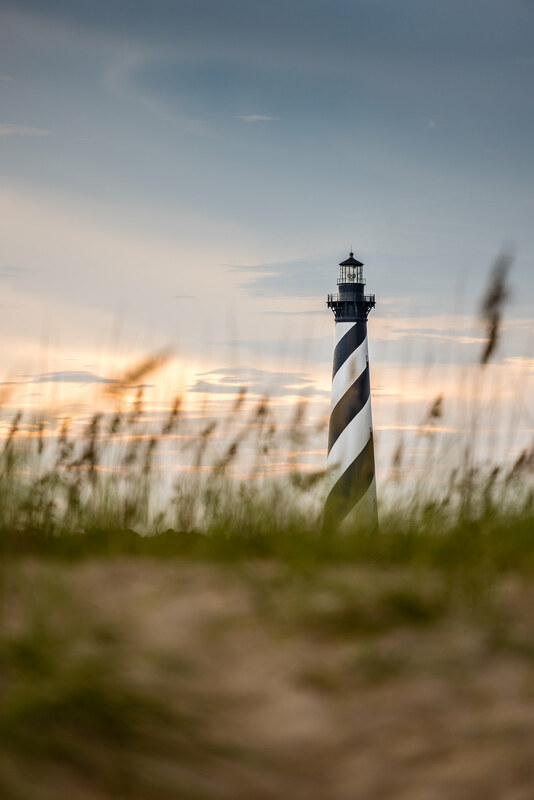 The Cape Hatteras Lighthouse https://en.wikipedia.org/wiki/Cape_Hatteras_Light is an operating lighthouse located near the southern-most point of Hatteras Island and the greater Outer Banks of North Carolina. Definitely plan on spending the day enjoying the beach, either before or after your shoot. The area definitely has that small beach-town feel (and the accompanying price increase on just about everything). The lighthouse grounds are small so any close-up wide-angle shots will have distortion and tomb-stoning. I highly recommend a tele-photo shot from the beach. Sunrise or sunset, you can walk the beach and get an appropriate angle. This shot was taken near the parking lot at sunset at 200mm. I’d recommend a fast shutter as the wind is always blowing near the point, and you may or may not want to freeze the movement of the reeds. 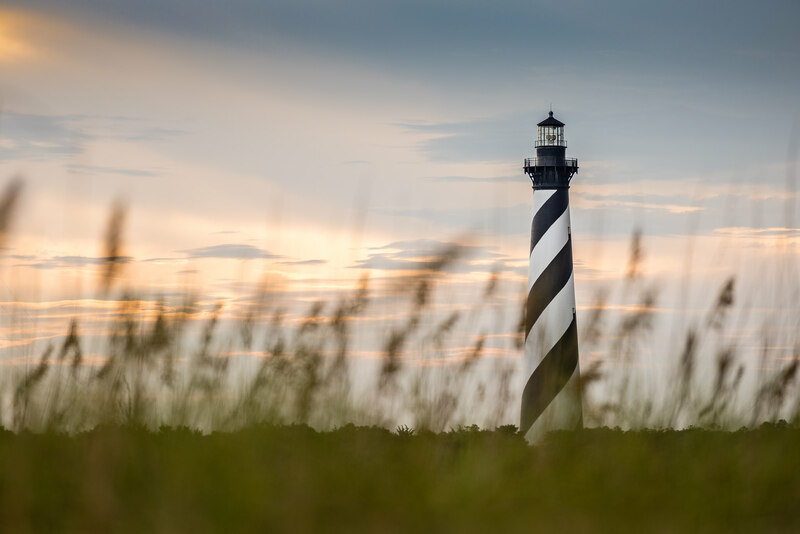 I’m planning on visiting for the 1st time the Outer Banks in April. Where can I take a pic of the Cape Hatteris lighthouse similar to the one with the grassy features around the base. I have a close friend after I take the photo draw it and but it on canvas for me. He is a fine artist. Thank you and hope ti hear back soon. If you search for the “cape hatteras lighthouse original location” there is a small parking lot there. If you walk towards the ocean from the lot, and look to your right, you will see this photo.